NORTHRIDGE, California — Demonstrating the strong market acceptance of HARMAN HiQnet as professional audio’s preeminent audio network configuration and control system solution, HARMAN Professional today announced that downloads of the newly-launched HiQnet Audio Architect version 1.0 has generated an unprecedented rate of downloads from registered audio professionals. 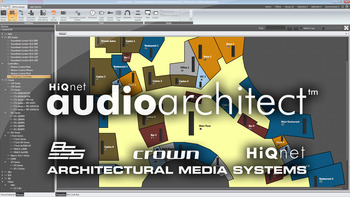 Audio Architect forms the third pillar of the new Architectural Media Systems installed sound solution, linking and combining processing and amplification from BSS Audio and Crown. HiQnet Audio Architect provides systems integration professionals with step-by-step application workflow from which a carefully-constructed modal interface is derived, embedding users’ workflows directly in the main application. With much of the development focus being on usability and user experience, it includes offline design tools specifically grouped for the system designer and online operation tools incorporated with the system, commissioning engineer in mind. Also included is an integrated Full Screen Mode designed for the day-to-day operator, making the right control panels and options available for each user, application and project. HiQnet Audio Architect automatically generates system control and monitoring interfaces that are instantly accessible regardless of the individual system hardware components. In doing so, it enables better workflows, encourages best practices and provides more efficient operation. HiQnet Audio Architect features an intelligent venue navigation system which provides a context-sensitive tree view of the entire design, filtering out unnecessary information for each stage of the built-in workflow modes. In doing so, screen noise is significantly reduced, even for complex designs, as is the need for training since for each workflow step only the relevant tools are presented. It also provides the ability to go online to address not just the entire venue but also individual rooms, racks or even devices. This provides significant benefits in maintenance situations by eliminating the need to shut down an entire system while troubleshooting or upgrading hardware. Audio Architect is the most comprehensive software application for routing multiple digital audio networks. It features system-wide drag-and-drop routing and is designed to support the full ‘A, B, C, D’ range of AVB, HARMAN BLU link, Cirrus Logic CobraNet® and Audinate Dante™ audio protocols to meet any and all the market’s networking demands. CobraNet compatibility assures legacy systems can continue to be supported and grown, AVB provides the path to an open standard networking future and lowers the barrier to entry for Ethernet-based media, and Dante enables complex audio routing in a managed Ethernet switch network. The BLU link bus complements all three Ethernet-based transports by providing a high channel count, low latency redundant ring connection between processors and amplifiers, simultaneously alleviating bandwidth from the Ethernet network and reducing switch port and switch count. Audio Architect enables configuration of open-architecture processors of the BSS Audio Soundweb London family in a new ‘Soundweb London world’. Enhancing the usability of London Architect equivalent features, Audio Architect includes a matrix control, improved GPIO configuration and improved Soundweb London preset configuration. It is also compatible with the new HiQnet Motion Control iOS app, enabling customized HiQnet control interfaces to be directly and wirelessly loaded onto iOS devices. HiQnet Audio Architect also features the capacity to launch HARMAN’s IDX-100 Designer software from a representation of an IDX server in the main system design, merging the management of HiQnet and IDX systems, and aligning the comprehensive IDX networked paging solution within the HiQnet system. As of the availability of Audio Architect, System Architect becomes legacy software. London Architect will continue a supported platform alongside Audio Architect while the full feature set is migrated over the forthcoming months. Audio Architect is available for free download from the new HARMAN Architectural Media Systems website, archimedia.harman.com.